Lily's Ink Pad: Happy Mail! As a college student and camp counselor, I lived for the days when I got happy mail. (note the guilt of not sending out more than I do now). In my family, happy mail was always a great thing. My mom and sister are great at recognizing every holiday. Me, I made cards and post them, but forget to send them! Enough guilt. What's a demonstrator to do when she wakes up early on a crop day after creating the night before (thanks to a late season snow day). Does she do her laundry? Make a great breakfast? Exercise? Nope. Those would all wake up the house. The answer: BLOG! Last night I created my hostess gift for today...well, part of it is already made, but I wanted something to put them in. TADAHHHH! Cute, huh? I bought these mailboxes at the Target Dollar Spot, a place I never can resist. Ever. I meant to create valentine's gifts, but well, I decided to use them now. The Sale-o-bration Designer series paper was calling my name. The ribbon bundle and the coordinating stamp set made this project easy. Plus, I got to use punches. A dream project for me really! I love how the Sale-o-bration products coordinate. And, they were free! (with three $50 orders) Shhhh. Don't tell Bubba that part! Sar, these are too cute! I just love our new SAB paper. Ok, now I 've really got to alter some of my mail boxes, and I thought I was on a roll! you crack me up :-D i can't resist the $ spot at target either. I got a whole mess of these mailboxes.....at least ten...the plan was to do something for valentine's day with them...never did get around to it. Isn't the SAB dsp great? I really like how you used it on your mailboxes. Have a fantastic week! All I can SAY is WOW!!!! How awesome I love it! 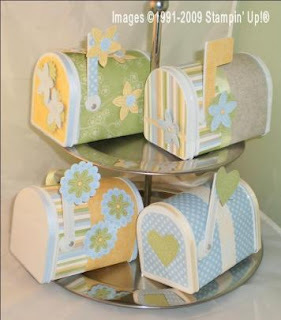 Your mailboxes are so adorable! I would book a workshop just to get one of them! Game Night Fun in a Box!